"Trinity and Beyond" is an unsettling yet visually fascinating documentary about the history of the design, development, production and testing of nuclear weapons. "Trinity and Beyond" is an unsettling yet visually fascinating documentary presenting the history of the design, development, production and testing of nuclear weapons between 1945 until 1963. 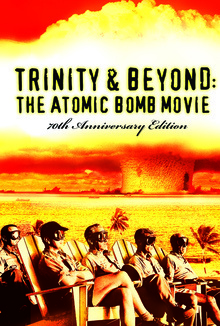 The New 70th anniversary special edition of "Trinity and Beyond - the Atomic Bomb movie" is 100 mins long, includes improved restoration, new shots and longer sequences in HD. Narrated by William Shatner with music performed by the Moscow Symphony Orchestra.